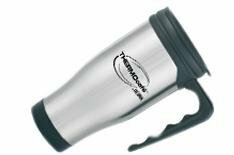 4th Thermos Thermocafe 2060 | What Car? Came third for keeping our drink hot it had dropped to 50C after two hours. It isnt watertight, though, so needs to be kept upright at all times. Simply slide back a flap on the lid and take a swig. The handle makes the Thermos easier to pick up especially if youve got small hands because the upper body of the cup is fairly thick. Its hard to argue with the 3 pricetag which even includes free delivery. The Thermocafe wasnt brilliant at anything, but was good at most things. It felt surprisingly classy given the bargain-basement price. The brushed metal casing should be hardy and resist scratches. Not a lot here but what do you expect for three pounds? A plastic handle with indentations for your fingers is about your lot.